New Year 2011 is finally here and apparently this post is the first post to kick start 2011. Firstly, I’d like to wish all our lovable readers, friends and subscribers a very Happy New Year. Wish 2011 brings joy, health, prosperity and you achieve all your goals in life! This post is just to share a little insight of WebTrickz’s journey in 2010. I started this blog in May, 2008 as just a hobby but after stepping in 2010, I conceived to opt this as a profession. 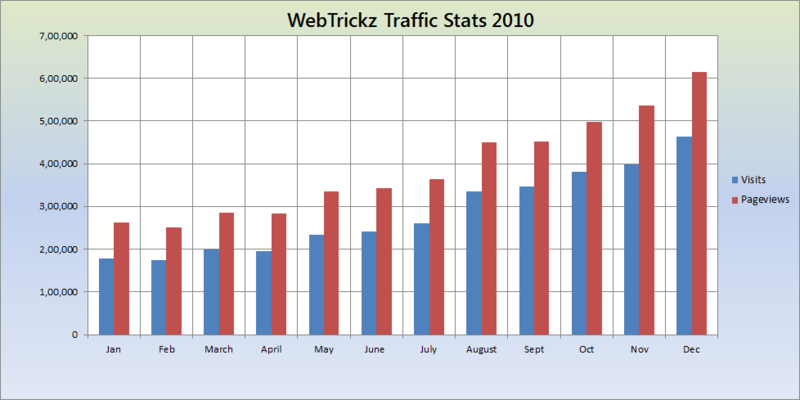 2010 was truly a good and lucky year for me since beginning in which WebTrickz made prominent and steady growth every month. This always pleased and motivated me to work more harder and smarter. A Total of 800 Posts were made in 2010 on webtrickz, mostly all were written by me. Thanks a lot to all our readers, friends, fellow bloggers, and my family for their love & support. This all couldn’t have been possible without you. I’m looking forward for more perfection, growth, and sharing great articles in 2011. Keep supporting us in future too! Ohho I think its the first time you’re showing your traffic or revenue. Good to see that your traffic has increase more than twice. Btw, what’s that spike in your revenue in December? Proud to be a Meeruthi where people like you are present. Health, happiness, joy and good luck !